Future buildings and neighbourhoods are expected to combine a manifold of Energy using Products ("EuP") ranging from electrical lighting to Heating, Ventilation, and Air Conditioning (HVAC) with locally available renewable energies (e.g. solar, wind) and with locally available storages (e.g. car batteries). An intelligent management of energy in such a local grid would enable customers to participate in the energy market and even contribute to the stability of the power grid. The problem is that such an energy management requires fine grained infrastructure and expensive hardware. 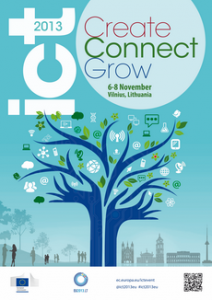 SmartCoDe has been assessed as an Excellence Project and has been invited to present at the ICT 2013 Event in Vilnius on 6-8 November, 2013. More than 5000 researchers, innovators, entrepreneurs, industry representatives, young people and politicians are expected in Vilnius. The event will focus on Horizon 2020 - the EU's Framework Programme for Research and Innovation for 2014-2020 and includes a conference, an exhibition, networking sessions, investment forum, and activities for students and young researchers. It will be opened by Vice President of the European Commission, Neelie Kroes and the President of the Republic of Lithuania, Dalia Grybauskaite. Don't miss the chance, register at the conference registration site and visit us at booth 5D15. The EU FP7 project SmartCoDe today announced the successful completion of the 3-year research project and the availability of the public Final Project Report. The report can be requested as a pdf-document free of charge at the contact page of the SmartCoDe home page. Demand Side Management and Demand Side Integration (DSM / DSI) approaches are currently only feasible in large industrial companies. A roll-out of DSM measures to the sector of consumer buildings, which are responsible for approximately one third of the overall energy consumption in industrialized countries, as well as DSM-enabling measures for Small and Medium Enterprises (SME) would be preferable, however, the setup is complex and costs are high. In October 2012 the SmartCoDe book titled “Embedded Systems for Smart Appliances and Energy Management” was published by Springer. It has been written and edited by SmartCoDe project partners and associated partners and focuses on the project topics as well as on adjacent areas. The book provides a comprehensive introduction to embedded systems for smart appliances and energy management, bringing together for the first time a multidisciplinary blend of topics from embedded systems, information technology and power engineering. The EU-FP7 projects “SmartCoDe” and “PEBBLE” today announced that they will coordinate two Special Days on “Energy Efficient Buildings” as part of the “Sustainable Energy in Buildings and Urban Areas” (SEBUA 2012) symposium in Kusadasi, Turkey, 14 - 20 October, 2012. Invited presentations will also be given by EU projects DESIMAX, AGILE, Energywarden and BaaS. “We very much appreciate the strong commitment of SmartCoDe and PEBBLE to the symposium”, said Professor Emilia-Cerna Mladin, SEBUA Symposium Chair and President of the Romanian Association of Energy Auditors for Buildings (AAEC). “Presenting the results from several European research projects in a condensed form is definitely an enrichment of SEBUA”. Approximately 40% of Europe’s total energy consumption still stem from small buildings and groups of buildings. 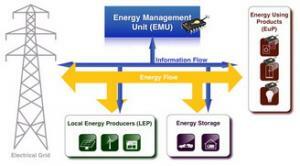 Energy management approaches available today however come at a price of several hundred Euro per managed device. SmartCoDe is developing an approach based on highly integrated microelectronic components, its target is to reduce the price from above mentioned hundreds of Euros to approximately 3 Euro per managed device. At the edaWorkshop 2012 in Hannover a new video clip was announced that explains the approach also to the non-technical user. The video clip is available at the SmartCoDe home page and on YouTube. One of the great challenges today is the reduction of Carbon Dioxide emissions. To reach the ambitious international targets, renewable energies from decentralised wind turbines and PV become more and more important. If the electrical energy can be consumed at the place where it is generated, the global grid can be release of user load. If this local consumption of energy is in addition coupled with an intelligent local energy management, such a so-called local cluster is able to react on under- or overload requirements of the global grid. As a result, local intelligent energy management can be provided as a balancing service to the overall grid. Most important for the above mentioned “intelligence” are microelectronic components as developed in the SmartCoDe project. When highly integrated and produced in mass series they can enable communication and control features as required by a Smart Grid. The 2nd SmartCoDe Open Expert Cooperation Workshop has been held on October 12, 2011 at the Hotel Westbahnhof in Vienna, Austria. Please find the full SmartCoDe Workshop Proceedings available for download at the bottom of this page. The Classification of Energy using Products (EuPs) in the household / office area where appliances are grouped according to the nature of their service, their interfaces, and the leverage they offer regarding energy management was part of the theoretical foundation for energy management in the first project year. The figure on the left shows an overview of the classification derived in SmartCoDe. 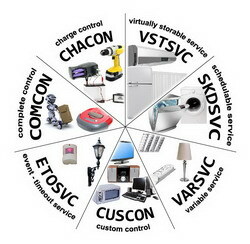 For example the “Virtually Storable Service” class contains all appliances which can act as virtual storages; typical representatives of this class are freezers or heating. If energy is cheap or abundant, these appliances can cool down, or respectively heat up a bit more than necessary such that they can stay off longer during more “costly” times, while still maintaining an acceptable service. The world must de-carbonize its energy production and consumption. But how? How can we achieve the necessary improvements in energy efficiency? How can we give consumers more visibility and control over consumption? How can local – often, unpredictable – renewable energy sources schedule their output for maximum efficiency? How can we optimize the mix of local energy production and the main power grid for maximum efficiency? How do we manage energy consumption at the building level – and even at the level of individual home appliances and office equipment?